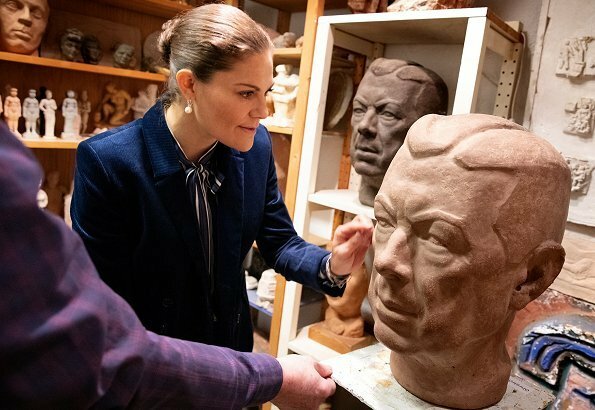 On December, 3, Monday, Crown Princess Victoria of Sweden visited Edvin Öhrström's workshop to get information about Edvin Öhrström's works of art. There are works of art created by Edvin Öhrström in the workshop and the workshop is currently used as an exhibition hall. 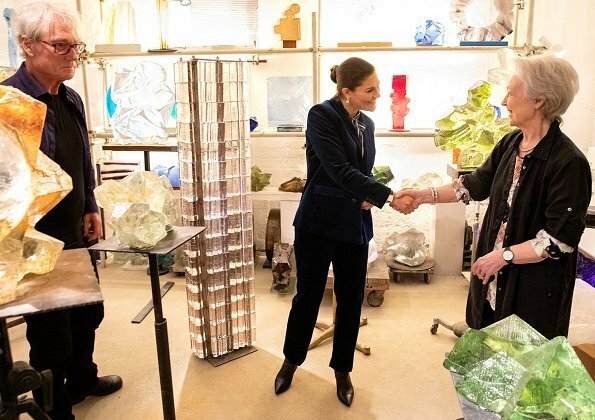 Edvin Öhrström's children, Hann-Marie and Sten Öhrström gave a tour to the Crown Princess in the workshop and gave information about the works. Karl Edvin Öhrström (August 22, 1906 in Burlöv – December 2, 1994) was a Swedish sculptor and glass artist. One of the most famous works of Karl Edvin Öhrström is the glass obelisk on Sergel Square in Stockholm. Victoria looks nice in the navy jacket and cute blouse. Trousers seem too short and I do not like the bun hairstyle. Not the best outfit today. Pants a bit too short.